Here it is, for your delectation, finally, the result of my House of Pinheiro pincushion swap efforts. 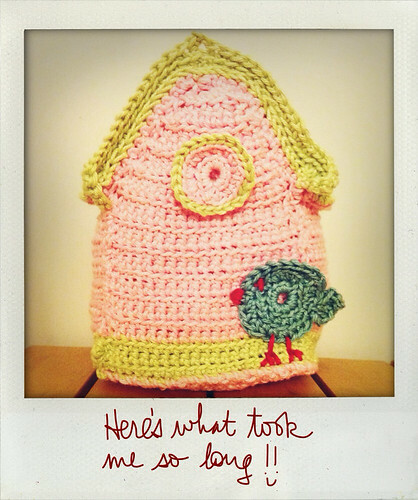 Yes, a little birdhouse! Did you guess from this little sneak peek I posted on Twitter, tweet, tweet? 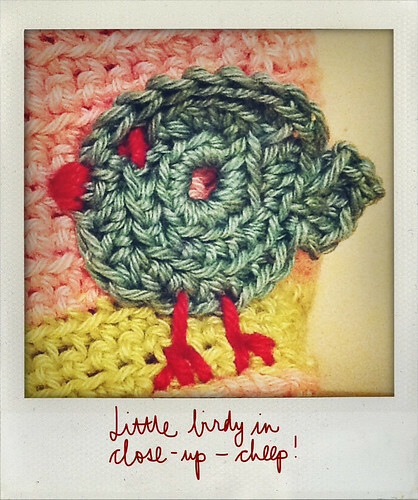 I really love little bird motifs (as you can see from my home to roost birdy) and just fell in love with a pattern for a birdhouse that I found, quite by chance, at Teeny Weeny Design’s etsy shop. As I’m still fairly new to crochet you can I imagine that it took a while to complete, including a few unravellings! But all in all I’m pretty chuffed with the result (and myself)! Most importantly, my pincushion swap partner, Candace, loved it. I hope she doesn’t mind me quoting her email: I received my pincushion and could not wait so I opened it at the post office (the girls at the post office knew that we were swapping and also saw the one I sent) and we are all in love with it! One of the best things about the swap has been meeting new people, it was worth every minute!